Recognized as the Head and Mother of all Missions in Alta and Baja California, the faithful parishioners of Misión de Nuestra Señora de Loreto Conchó, founded in 1697 in Baja California Sur, and the faithful parishioners of Mission San Buenaventura, founded in 1782 in Alta California, have entered into a covenant and commit to support each other in prayer to: Witness the Gospel, cultivate our religious heritage, provide temporal resources and encourage pilgrimage to all the missions in the Californias in fidelity to Holy Mother Church, the Holy Father, our respective bishops and dioceses as Sister Missions. For centuries Loreto was inhabited mainly by pericúes Indians, who lived from picking fruit, hunting and fishing. The arrival and unsuccessful colonization of the Spaniards in 1533, and the subsequent successful Jesuit missionaries in 1697, who established in this locale the first mission of the Californias led by Father Juan Maria Salvatierra, Loreto became the historic capital of Alta and Baja California until 1777. Loreto is the starting point for the historic El Camino Real corridor that follows north along the ancient route of the Spanish missions from Misión de Nuestra Señora de Loreto Conchó to Sonoma, in Alta California. From Loreto, Franciscan Friar Saint Junipero Serra planned the missionary expedition north to Alta California. In 1782, he established Mission San Buenaventura among the native Chumash Indians who inhabited the coastal areas for centuries and were known as “bead maker” or “seashell people” who as hunters, gatherers, and fishermen, recognized their dependency on the world around them. The Mission by the Sea across from the Channel Islands became the ninth and last mission founded by Saint Junipero Serra. 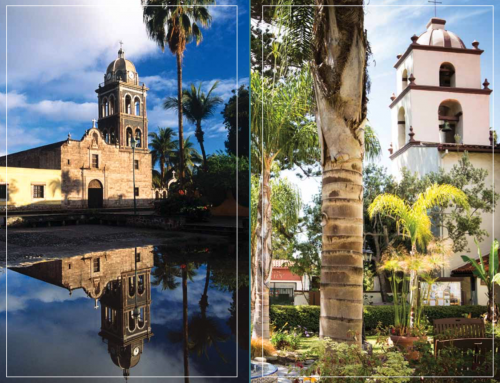 In 2015, our representatives in civic government from San Buenaventura and Loreto adopted a Sister City relationship. Respectively, the two national parks off our mutual shores have inaugurated a Sister Park/Sister Reserve Project: Bay of Loreto National Park-Channel Islands National Park and the University of California Natural Reserve System. These initiatives will benefit the greater Loreto and San Buenaventura communities by creating new economic opportunities, facilitate cultural exchange and expand education opportunities for residents. With extended outreach and ecotourism programs, the business network and social fabric of our communities will be strengthened, benefiting present and future generations. Unique to this relationship is the religious history of our missions, which is the foundation and very fabric of our mutual heritage that has sustained our communities for centuries. This Sister Mission partnership may also support each other during natural disasters or other emergencies by raising funds or collecting needed supplies. By sharing each other’s cultures through sister relationships, communities can gain insight into the history, values, and spirit that make up their sister mission, sister city and sister national parks and reserves.